Whether it's raining, snowing or a 75-degree sunny day outside, there's nothing wrong with spending time enjoying a few indoor games for kids. Children of all ages like to spend some time inside and not necessarily on a computer or in front of a television. Preschoolers love to stay busy, or they will get bored. It's as simple as that. It really doesn't take much to entertain them either. This age group loves to create, build, destroy or even just use their imagination. These activities can keep them busy for hours. Dress-up -- Get a laundry basket and fill it with old clothes, hats, shoes and costume jewelry. Thrift stores are a great place to purchase some fancy dress-up clothes for your preschooler. Be sure to take pictures! Pretend cooking -- Let the little chef come out in your child as he plays with dry food such as pasta, flour, rice and various kitchen pots, pans and utensils. Indoor Preschool Picnic -- Rain or shine, an indoor preschool picnic is a crowd-pleaser and even better if you have a group of children to entertain. Just because your children are indoors doesn't mean they have to be stationary. There are many ways to get preschoolers moving while having a great time too. Music -- Put on your favorite CD and just dance. Don't forget to throw a "freeze" in there once in a while. Indoor Obstacle Course -- An indoor obstacle course promotes large motor skill development and patience. Parachute Play -- Just clear the furniture from a large room and use a flat sheet or large tablecloth to act as the parachute. Works great with several kids and adults as they fling it in air, run underneath it or just watch it drift down. By the time children reach elementary school, they are old enough to cooperate when it comes to playing indoors -- the running around and screaming is usually kept to a dull roar. Children at this age love independence and do more things by themselves or with their friends without the assistance of Mom or Dad. Totally Gross the Game (ages 8-14) -- This game teaches your child all about the world of science with more than 200 questions and activities. Tic-Tac-Toe Tournament -- The X's and O's will have a field day with this. 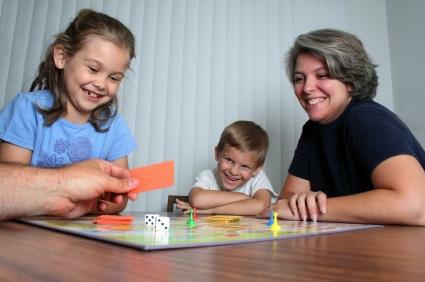 Set up teams and playing times, and find out who the Tic-Tac-Toe champion is in your home. Hangman -- Use your child's spelling list from school in this simple, at-home game. You can find many Word puzzle games your child can choose from as well to help with spelling. Battleship -- The homemade version of the classic Battleship board game is easy and uses graph paper or this template. Just draw in your ships and have fun! Some indoor games for kids can be related to science, which for most can be quite intriguing and should probably be done under adult supervision. Baking Soda Bubbles -- Here's a neat experiment to see how bubbles are formed. Make Your Own Glue -- Don't get into too sticky of a situation with this experiment. Polishing Pennies -- Shine up those pennies from your piggy bank with this project. Planning games for your children -- especially if they are all of different age groups -- can be fun, but it also may take some time to get it right. You have to think about where you want the indoor games for kids to be played, who will be participating and if the games are something the kids will want to play again.